I got up to the Beacon at about 3:45pm with. Tim Crow was there and told me that Bryan Hindle had been there. The wind was from the West but there were some large thermals changing it's direction. I was flying a white and purple paraglider. I got up to 1100m above the top of the hill, which was most of the way to the clouds, over the Malvern Hills Hotel ( near British Camp ). 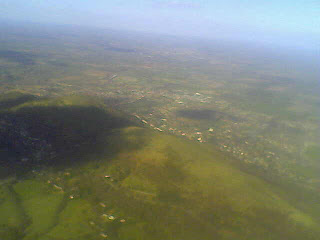 The picture is from about 500m above the hill, taken with my scratched mobile phone. I made a phone call when I was at 600m above the hill; is that illegal use of radio in the air? My lips were getting a bit numb with cold. I came back to the hill to chat to a paraglider pilot who had walked up. The wind died off and went round to the left. Dan Heeks.